We’re holidaying with my 9 year old niece who loves to craft so to repay her for making me a loomies bracelet, I sat down with her to make a card. On-the-spot-young-girl cards are a bit challenging for me, but I had a ton of fun because I had someone interested in what I was doing for once – not like my 17yo and 14yo boys. 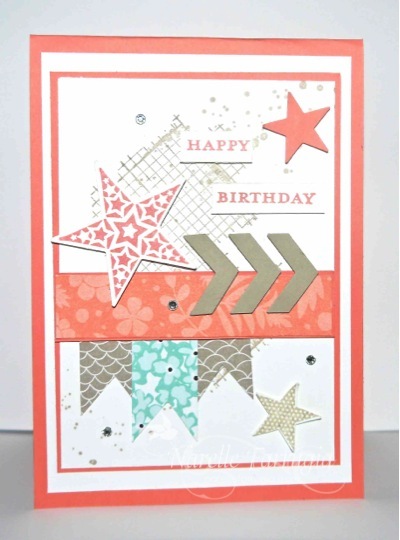 Seize the Birthday has a Buttons and Rhinestones challenge this week so I set about making a card for this challenge. I’ve used some Stampin’ Up! Sweet Sorbet DSP, stars and bling and I think she really liked it. The stars are from Stampin’ Up!s Simply Stars and the sentiment is from Morning Meadow. For a bit of extra interest in the background I stamped Off The Grid and Gorgeous Grunge. Very pretty card, great sketch and colors. Thank you for joining us at STB this time. Great card…..love that background! Thanks for joining us at Seize the Birthday!